If you never used Webasyst before, first sign up Webasyst Cloud, the most easy option, which is free during the first 30 days, or install Webasyst on your own web-hosting server (this option requires certain skills in installing PHP scripts). Upon logging into Webasyst backend, you will find "Installer" section in the main menu. 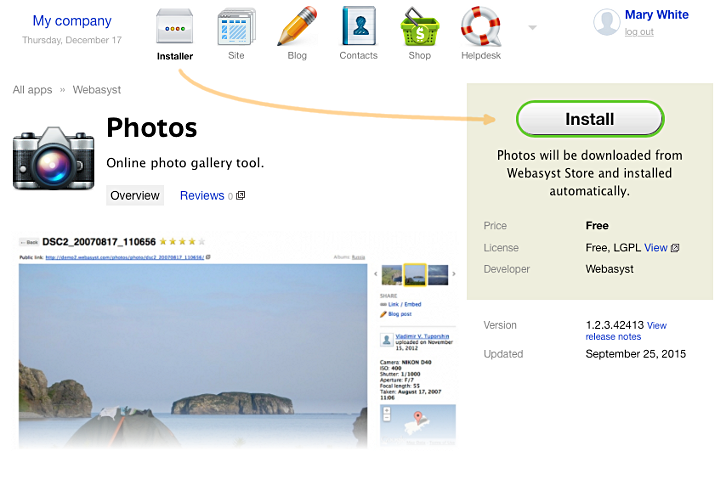 Use it to install any additional software products, which you can also see Webasyst Store. If you are installing a paid product, you will be offered to purchase it during the installation. You will be able to complete the installation, after your order is processed.